Harlem River Bridge; photo courtesy of the MTA. 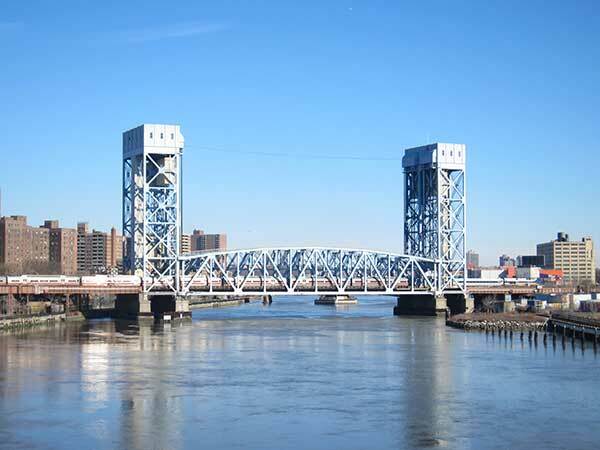 Starting September 15, the Harlem River Lift Bridge will not open for boats for six months while workers replace 60-year-old cables that lift the bridge and install all new electrical components designed to increase their resiliency to potential storm surge flooding. The railroad bridge, located about 4 ½ miles north of Grand Central Terminal, connects the island of Manhattan to the Bronx mainland. In addition to replacement of all the original cables that lift the two, 340-foot-long, three million pound spans, the project includes a new electrical control system and wiring and a new third rail power supply system. The new Facility House electrical components, damaged during Superstorm Sandy, will be installed to increase their resiliency to potential storm surge flooding, thanks to a $5 million federal Sandy Emergency Relief grant. Outdated electro-mechanical controls will be replaced and computerized with the installation of a dual-redundant, programmable logic control system. The elevators from the track level up to the operator’s rooms at the counterweight level also will be rehabilitated. New multi-conductor, copper and fiber optic cables will be pulled through a micro-tunnel under the Harlem River that was bored under a prior Capital Program. The entire $47 million project is being paid for by the Metropolitan Transportation Authority’s 2010-2014 Capital Program with help from federal grants of $24 million (including the $5 million Sandy grant). The two-year project has been scheduled to take full advantage of the six-month Coast Guard outage and minimize impacts to Metro-North customers. Most boats, including the Circle Line tours, can navigate underneath the unopened bridge, which provides vertical clearance of 25 feet at high tide. When opened, the bridge provides 135-foot clearance. The bridge was built in the 1950’s by the New York Central Railroad and completed in 1954 to replace an earlier swing-style span. The bridge has parallel lift spans, each with two tracks. The spans operate independently. At either end of the bridge are steel towers that contain the machinery to hoist the spans. In all, 128 main cables, each 2⅜ inches in diameter and 185 feet long, connect the ends of the bridge spans to their balancing counterweights high above in the lift towers. Spools of replacement cables, each weighing more than a ton, will be brought to the bridge on barges, lifted to the platform by crane, and hoisted into place by electric winch.